Electric and magnetic (EM) radiation patterns and levels for standard tower designs and line capacity are well established. New conductor designs allow higher currents on existing routes and towers, and mixing AC and DC on the same route is becoming common. All of these factors could result in an increase in levels or change in patterns on an established route. Mitigation methods are being developed to maintain fields within statutory limits. Transmission lines are increasing in voltage and current carrying capacity, while at the same time, servitudes are becoming limited and urban areas are expanding into existing servitudes. There has always been a concern about the effect of EM radiation from power lines (PLR), both on the utility staff, working under the lines, and on people living or working in close proximity to the lines. Table 1: Reference levels for exposure to EM radiation (ICNIRP). 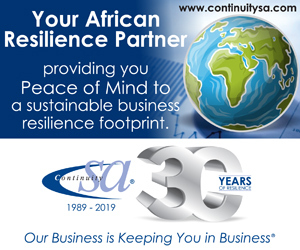 To avoid health and safety risks, standards limiting the maximum levels of EM radiation in the vicinity of power lines have been established and are strictly adhered to. Changes in the current carrying capacity or configuration can affect the EM radiation values or patterns, and this needs to be taken into account when changes are made. Overhead power lines generate both electric and magnetic fields. Fig. 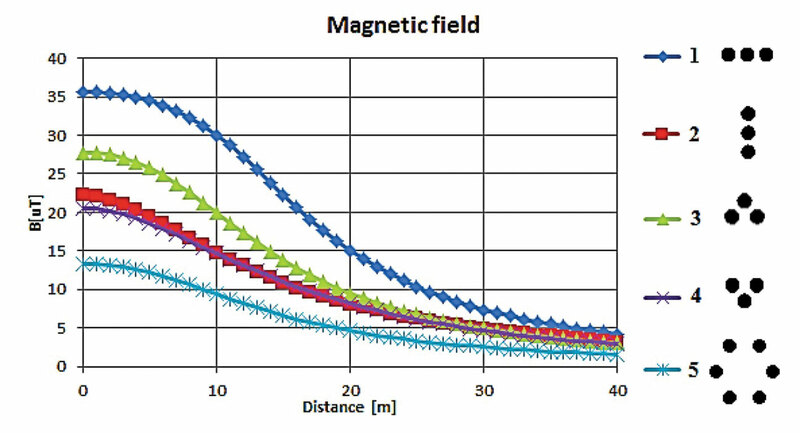 1: Calculated magnetic field values at various distances from the line . Are linked to the voltage of the power line and remain relatively stable while the line is energised. Can be reduced (shielded) fairly easily. Decrease with an increase in distance from the line. Are linked to the current flowing (load) on the line. Magnetic field levels in the vicinity of a power line typically show daily and seasonal variation patterns. Can be reduced. Reducing magnetic fields require special engineering techniques or line designs. Fig. 2: Transposed and untransposed phasing . Setting standards for maximum levels of EM radiation is difficult as there is little conclusive evidence on the long-term effects of exposure to EM radiation on people, and laboratory work must be confined to tests on animals or individual cells rather than living people. Fig. 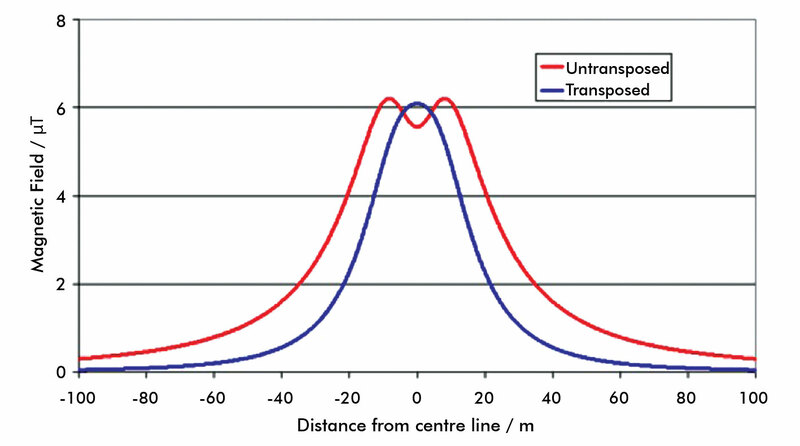 3: Effect of transposition on the magnetic field . It is difficult to determine the long-term effects on humans because few people stay in the same place for long periods of time, and the electric field strengths vary. 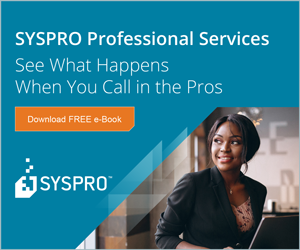 Most standards are based on the avoidance of both short-term effects which can cause discomfort or danger to people, and long-term effects which could cause health problems. This includes sensory effects as well as visual disturbances. Such limits have been established by laboratory work with volunteers and on rats. 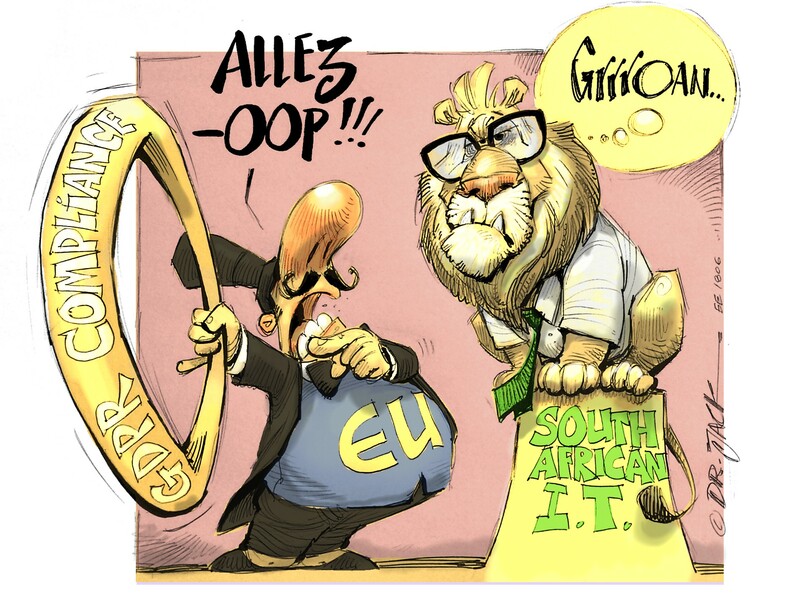 The guidelines for electric and magnetic field exposure set by the International Commission for Non-Ionising Radiation Protection (ICNIRP) receives world-wide support and are endorsed by the Department of Health in South Africa. The ICNIRP guidelines set a basic restriction on the density of electric current induced in the body by ELF fields. As induced current density is difficult to measure in the body, the guidelines also prescribe reference levels in terms of the more easily measured field strengths. The standards attempt to limit EM fields due to power lines to values in the range that would normally be encountered in a building supplied with electricity. The values used in the guidelines are shown in Table 1. Table 2: Methods used to mitigate radiation from power lines . Line compaction Reduction in phase spacing. Marginal Low May introduce corona; may limit available techniques for live line maintenance. Reverse phase (transposition) Reversal of phases on double circuit line: RWB – BWR. Good Low Only applicable to double circuit lines. Delta or reverse delta configuration Conversion from horizontal flat configuration to delta configuration. Good Medium May introduce corona. Split phase Splitting of phases to create additional phases with spatial placement to create significant field reduction. Exceptional High Interphase spacers required; increase in complexity of line structures. In addition to the immediate danger of electric shock or other effects from high electric or magnetic fields, there is the potential danger of long-term exposure to weak EM fields in the vicinity of power lines. There are numerous studies that attempt to link EM radiation from power lines to various health problems. Although there is a weak correlation between living in the vicinity of power lines and health problems, especially in children, researchers have been unable to establish a causal relationship between the levels of EM radiation which people are subjected to and the particular health problems. Furthermore, the results of the studies are suspected of being affected by various factors, such as selection bias, confounding factors and others. 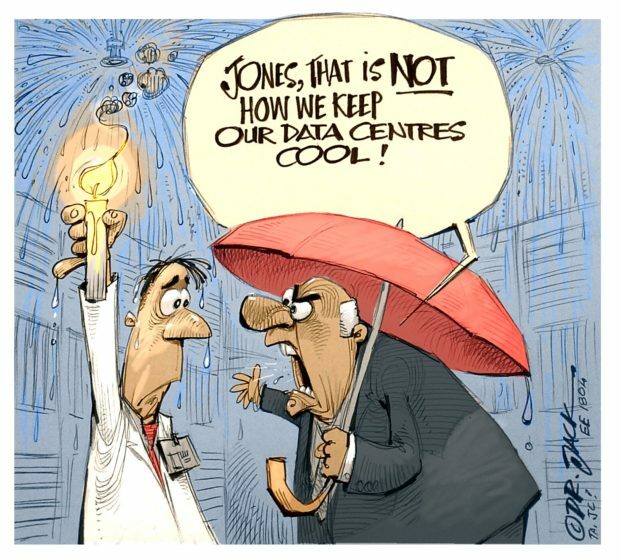 Most health organisations agree that there are no incontrovertible grounds for associating the health problems concerned with proximity to power lines. The absence of evidence of health effects, however, is generally not considered to mean evidence of the absence of health impacts, and this has resulted in scientists and many authorities advocating caution and finding ways to avoid or reduce exposure to EM radiation from power lines. 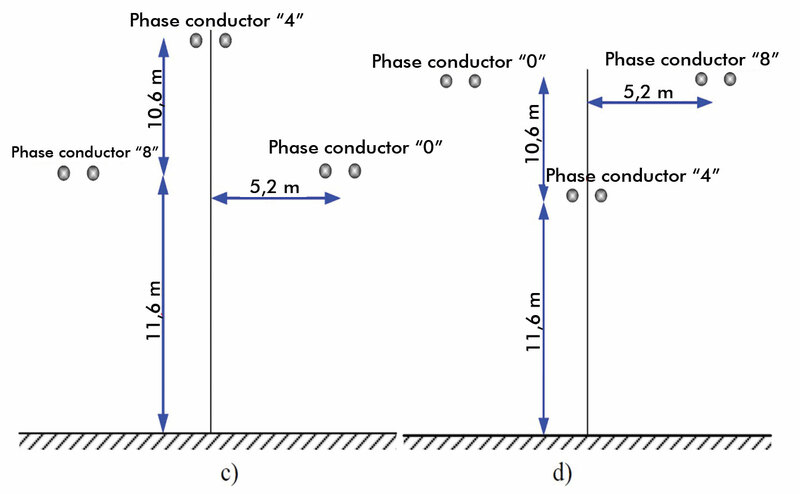 The electric field, which is proportional to voltage, will be nearly constant under a transmission line since the line is held at nearly constant voltage. On the other hand, the magnetic field, which is proportional to current, will vary greatly during the day as the power requirements on the transmission line vary. In discussing the magnetic field near a transmission line, it is important to distinguish the current that was used to determine the magnetic field level. Increasing the current carrying capacity of a route will not alter the radiated electric field but will increase the magnetic field in proportion to the increase in current . Fig. 4: Line configuration . EM fields exist all around the transmission line and will have different values depending on the measurement point chosen. 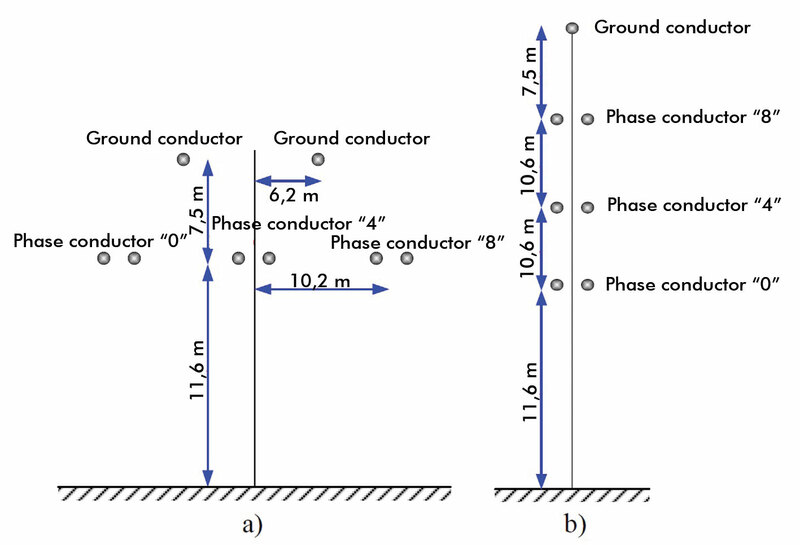 The preferred height above ground for assessing fields, particularly electric fields, under or in the vicinity of power lines is 1 m, and this is specified in the ANSI/IEEE standard. 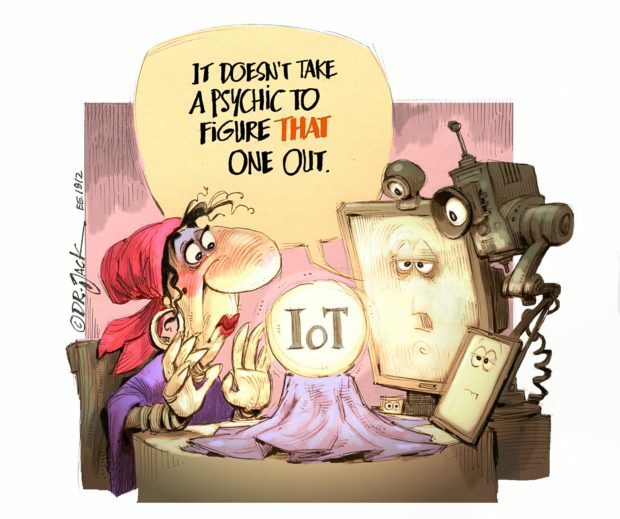 There is a scientific reason why 1 m was chosen when considering induced currents and compliance. The derivation of an external electric field from the basic restriction (the induced current density) is performed for uniform fields. Under power lines, the field is not uniform, increasing by typically 10% or so over the height of a person. The question is therefore, at what height does this non-uniform field induce the same current as a uniform field? The answer is, to a first approximation, at the half-way point up the body, making 1 m a reasonable approximation . For magnetic fields, currents are induced mainly in the head and trunk, so a similar argument might lead to a slightly higher height, perhaps the centre of the chest. But 1 m is usually taken as the standard for magnetic fields too. Fig. 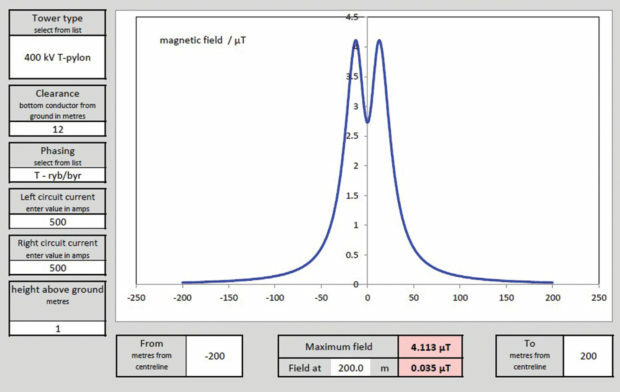 5: Effect of increasing the height of the line on the magnetic field . Calculation of fields requires modelling of the transmission line and application of basic electromagnetic theory. Some mathematical models can be extremely complex, but reasonably accurate results have been obtained by fairly simple models. Models agree closely with actual measurements, although it is difficult to compare readings taken from a working line with calculations, due to variations in the load on the line at the time of measurement, variations in line parameters due to temperature (sag etc. ), deviations in the line configuration from assumptions in the model (span length, changes in direction) and other factors. Calculating field strengths involves complex calculations which depend on both the current carried and the configuration of the power line. Most methods require assumptions to be made, such as modelling the line as consisting of perfectly straight conductors of infinite length, and then applying various techniques to allow for span length and sag. Fortunately, there are numerous computer packages available which can perform the calculations using standard configurations, which simplifies the process considerably. Fig. 1 gives an example of results obtained using an online calculator provided by the energy networks association (ENA) , based on a standard tower configuration. Fig. 6a: Horizontal configuration; Fig. 6b: Vertical configuration. Phasing is the way the two circuits on the opposite sides of a pylon are configured relative to each other. The field produced depends on the relative phasing of the two circuits. There are two main types of phasing: transposed and untransposed (Fig. 2). Fig. 6c: Delta configuration; Fig. 6d: Reverse delta configuration. A few transmission lines (and many distribution lines) have “untransposed” phasing, with the phases in the same order from top to bottom on the two sides of the towers. Each side of the tower produces a similar magnetic field. Because the order of the phases is the same, the two magnetic fields are always in the same direction, so they add up. The resultant field to the side of the line is the sum of the two. Most lines have “transposed” phasing, with the opposite order of the phases on one side to the other. The magnetic fields from each circuit are opposite and there is a degree of cancellation between the fields. Optimum phasing is defined as the relative phasing of the two circuits that, to the sides of the line, produces the greatest degree of cancellation between the magnetic fields produced by the two circuits, and hence the lowest resultant magnetic field. Optimum phasing is clearly best to minimise the fields to the side of the overhead line. 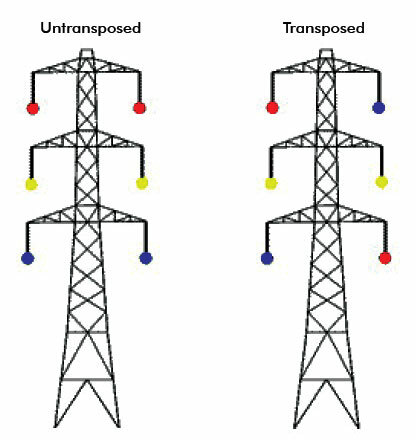 Transposition results in optimal phasing, but it is not always possible to achieve because of system or other engineering considerations, and all overhead lines, be they transposed, untransposed or one of the many other combinations of phasing, must comply with other standards and regulations. Fig.4 illustrates the effect of transposition the magnetic field. Transposing of single circuit lines involves altering the positions of conductors at regular intervals along the route. This involves the use of transposition masts or towers to allow clearance between the lines. Fig. 6e: Split phase configuration. 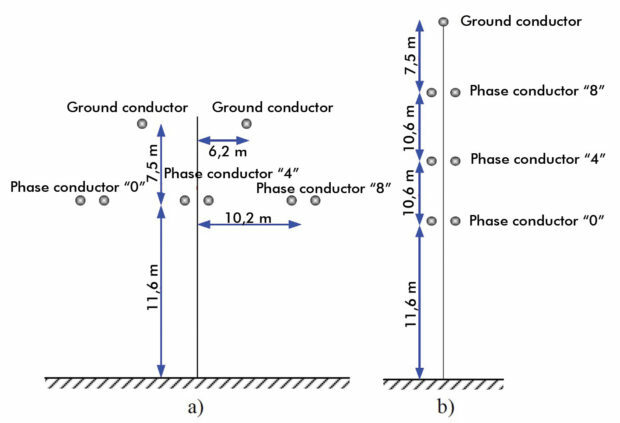 The effect of changing the line configuration and line height for a 400 kV line on electric and magnetic fields have been investigated for several of the methods listed in Table 1. 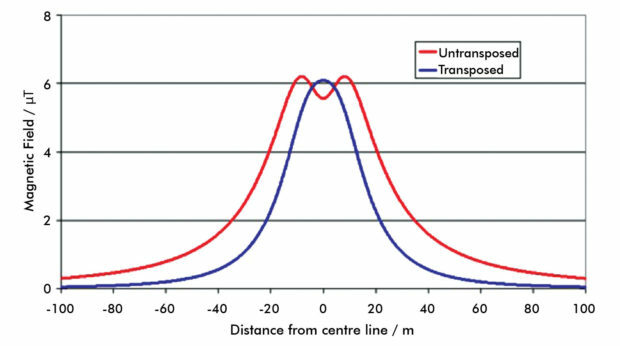 The line under consideration in the study is shown in Fig. 4. Fig. 5 shows the effect of increasing the height of the lines above ground for the configuration in Fig. 4 with varying the height of the lines for 1, 2, 3 and 4 m, respectively. Increasing the height has a marked effect directly under and close to the line, but the reduction decreases as the distance from the line increases. Fig. 6 shows the different configurations used in these figures . Phase “0” = red, phase “4” = yellow, phase “8” = blue. Increasing the height of the transmission lines certainly leads to a reduction of electric and magnetic fields within the servitude of the transmission line, but the most significant reduction for the horizontal configuration given in Fig. 4 is achieved by reconfiguring the conductor placing. This decreases as the distance from the centre of the line decreases but is still lower than that for the reference configuration. Since the reduction is usually required outside the servitude, this solution is not necessarily the most suitable for high voltage transmission lines. Fig. 7: Comparison of magnetic fields for different configurations considered . In addition to the configurations which relocate phase conductors, it is possible to use the so-called “split-phase” (curve 5 in Fig. 7) or splitting of the phase conductor to use multiple conductors per phase. This configuration can significantly reduce the magnetic field. 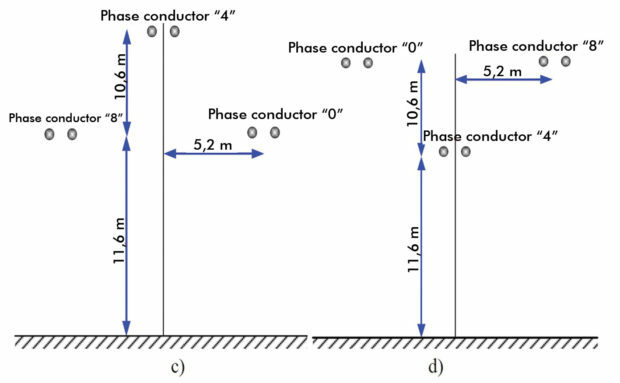 The configuration forms two systems of conductors, one with the phases in sequence RYB from top to bottom and the second with the phases in the sequence BYR from top to bottom. 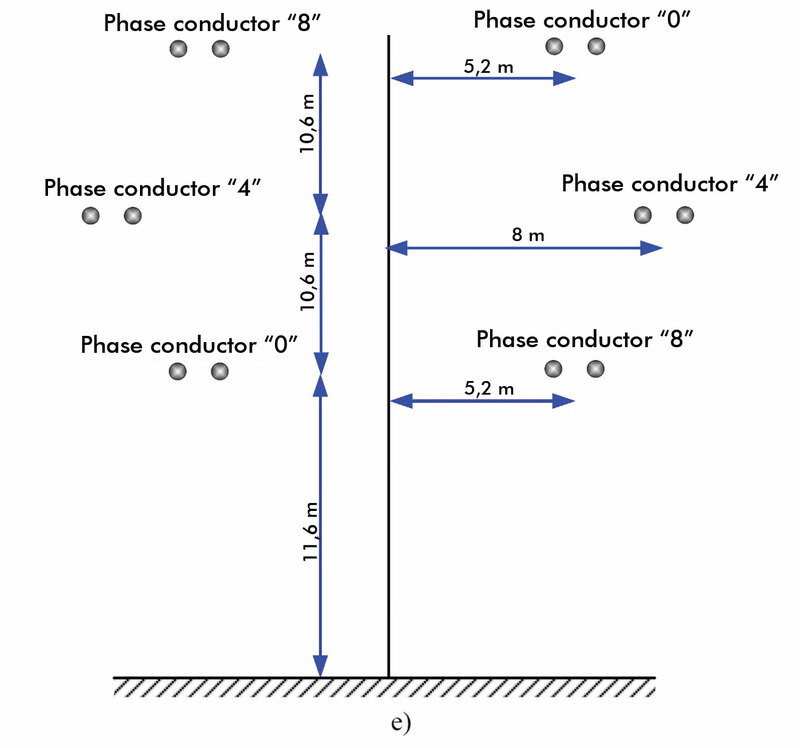 The total value of the current through each phase is divided equally between all its conductors. This configuration gives the best results in terms of magnetic field and very good results regarding electric field, as shown by curve 5 in Fig. 7. The “split- phase” transmission line configuration has certain disadvantages, such as the high cost, in comparison to other transmission line configurations, due to the fact that this configuration requires twice as many conductors, as well as insulator strings necessary for connection to the tower, and more of other equipment is also needed for this configuration. Transmission line towers for the “split-phase” configuration are more complex to manufacture and install, and therefore more expensive compared to towers of other configurations. However, when the reduction of electric and magnetic fields is necessary in a limited number of ranges, this solution has many advantages. The magnetic field can be reduced by placing closed loops of conductors in the vicinity of the power line (usually underneath, or on the side if a specific structure is to be shielded). Loops may be passive, using induced current only, or active loops supplied with their own current. Loops are only used for localised shielding. PH Pretorius: “Electric and magnetic fields form overhead power lines – A summary of technical and biological aspects”, Report prepared for Eskom by Empetus. ENA: “Height above ground for measurement ”, Energy Networks Association, September 2017. ENA: “On-line calculator: Calculate magnetic fields from selected UK overhead power lines”, Energy Networks Association, September 2017. E Salinas: “Mitigation of power frequency magnetic fields”, Doctoral thesis, Chalmers University of Technology, Sweden. P Sierck: “What is EMF (Electromagnetic Fields) 101”, EMF & RF Solutions. A Mujezinovic, et al: “Analysis of the possible solutions for the reduction of electric and magnetic fields near 400 kV overhead transmission lines”, WIT Transactions on Ecology and The Environment, Vol. 181.